UHN Medan Visit UMY Discussion For KUI Management. On August, 9th, Universitas Muhammadiyah Yogyakarta (UMY) has received visitor from Universitas HKBP Nommensen (UHN) Medan, West Sumatera. 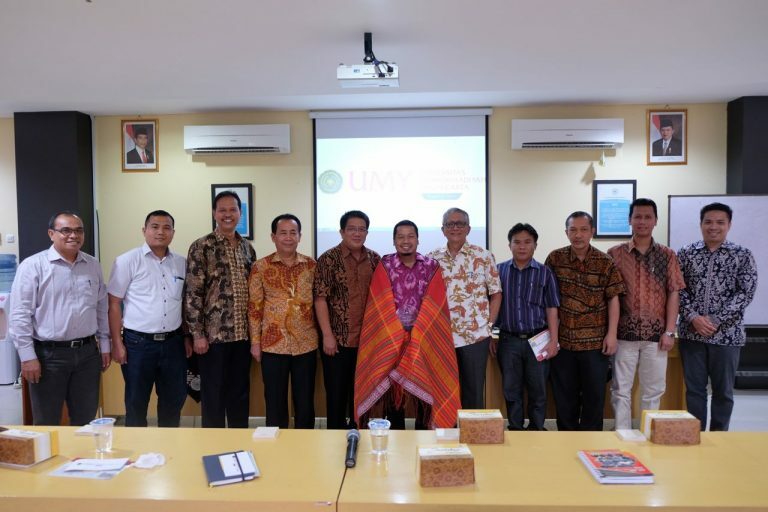 The visits made by UHN are in the framework of the comparative study activity to briefly discuss about the governance and activities related to the international program at UMY. The discussion held in Courtroom of the Graduate Director, Kasman Singodimedjo Building. During the visit, UHN discussed various issues and problems that they experienced in KUI management, one of which is fund management for internationalization program. “For the management of funds, UMY has various business units that can increase the coffers of funds. Such as PT. Mentari Prima Niaga engaged in construction, as well as UMY Boga, UMY Tirta, and Sportorium. The business unit is very helpful UMY development programs in both academic and non-academic fields. It is indeed recommended by Muhammadiyah Central Leaders who encourage each Muhammadiyah Higher Education to be independent. This makes UMY not depend solely on the education money provided by the students. So it is able to finance and reduce costs to be incurred by students, “said Sukamta when answering how UMY manages funds for the internationalization program. Yordan stated “With so many international programs owned by UMY with cooperative institutions, the initial impression for financing would be expensive if students or lecturers were to follow suit. UMY does provide a budget for such activities. Nevertheless we at KUI are trying to keep the costs down at university. Here the negotiation of the deal plays an important part, namely by negotiating the offers we give and receive when we want to cooperate. For example our MoU with Singapore Polytechnic, we agreed to finance the students they send during their studies at UMY and vice versa. The financing in the form of shelter and living expenses that if compared would be much cheaper than we finance our students directly,” when asked how tactics to reduce the cost of international programs owned by UMY. There are various international programs owned by UMY that are offered to the campus academic community. Such as exchange of students and lecturers, joint research, international KKN, and summer school for foreign students from various interested fields. This sublime discussion held almost two hours, enlighten UHN delegates in bringing their university to an advanced and competitive education equivalent to other top universities. Dr. Haposan Siallagan, SH., MH. (Vice Rector I) UHN hopes that ideas can help. “We are very grateful to UMY for giving us the opportunity to make this visit. This discussion really inspires us and hopefully can be an idea to UHN further advance,”he concluded. The visit was attended by 9 participants from UHN, Dr. Haposan Siallagan, SH., MH. (Vice Rector I), Drs. Charles M. Sianturi, MSBA. (Vice Rector II), Dr. Hilman Pardede, M.Hum. (Vice Rector IV), Dr. Marlan Hutahaean, MSi. (Chairman of LPM), Dr. Initially Sigiro, MSi, .PhD. (Director of the Office of International Affairs), Drs. Champion Simanjuntak, MSi. (Ka.Biro Academic Development and Accreditation), Jinner Sidauruk, SH., MH. (Academic Bureau Chief), Ardin Dolok SarBapak, SE., MSi. (Head of Finance Bureau), and Sabar M. Tampubolon, SE., MM. (Head of Accreditation). The visit was received by Dr. Ir. Sukamta, MT., IPM., As Vice Rector I Academic and Yordan Gunawan, S.H. Int. MBA. As Head of the Office of International Affairs (KUI) of UMY.